How it works: You can add more clocks as needed, no limit. The Wireless Clocks in a Box bundle is all you need to get your facility clocks working on the same time. This pre-engineered solution will get your facility up and running quickly at a very affordable price. For convenience, everything is you need is all in one box. The dependable 902-928 frequency-hopping technology transmits a wireless signal to the clocks. Clocks in a Box is the ideal starter solution for synchronized timing needs for all building types under 250,000 sq. ft. Larger building accomodations available upon request. 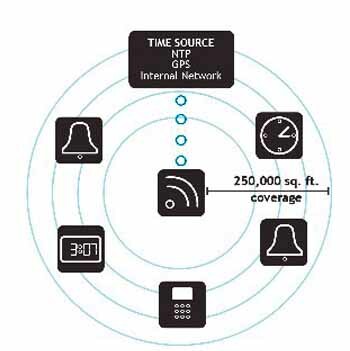 The systems time source is NTP with optional GPS. Bell scheduling is also available, making the Clocks in a Box the perfect starter solution to all your synchronized timing needs.